The Next Big Thing Blog Hop is a viral campaign to help bring awareness to writers and their works in progress and hopefully find new fans to their work. Recently I wrote an entire blog post on this subject about my participation in the online Harry Potter fandom debates (back when the series was incomplete). I began researching the symbolic meaning of hippogriffs. That led me to read the epic poem Orlando furioso. I was amazed to discover an intricate tale of medieval knights in battle, and was drawn to one storyline in particular that featured a warrior maiden in love with a virtuous knight who was on the opposite side of a holy war. Part 2 of this answer will be finished in Question #9. Epic historic fantasy or Carolingian legend. My hero Ruggiero needs to be young and handsome. 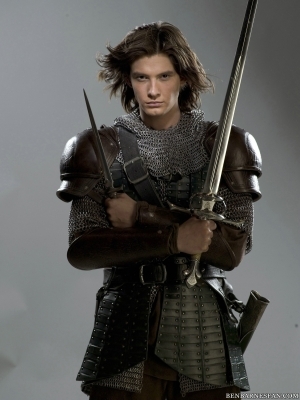 I like the idea of Ruggiero being played by Ben Barnes, best known for his role as Prince Caspian in the Chronicles of Narnia films. Here is a publicity still from that movie. For my heroine, I would love to have Jennifer Lawrence play the part of Bradamante. Her portrayal of Katniss Everdeen in the Hunger Games movies demonstrates the strong and determined nature of Bradamante as well as her beauty. The character is also tall, and Jennifer Lawrence is about 5'8" a good height to play the role.